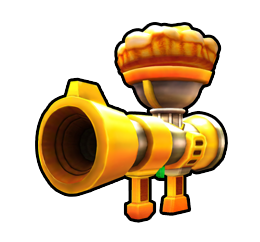 The Pie Bazooka is an item found in Mario Kart Arcade GP DX. In the game, the player can use the Pie Bazooka to throw a Pie forwards, giving that item's effects to the racer to front of them. This page was last edited on June 22, 2018, at 09:48.